Vancouver, B.C. - Corvus Gold Inc. (“Corvus” or the “Company”) - (TSX: KOR, OTCQX: CORVF) announces results from holes NB-14-400 and NB-14-401 which have respectively returned broad intercepts of 36 metres @ 17 g/t gold and 32 metres of 5 g/t gold (Table 1).Â These new results continue to fill a gap in the previous drilling in an area targeted for high-grade mineralization related to shoot development (Figure 1). Â This release represents the first three of 18 completed holes with another 10-12 planned holes in the phase two 2014 drill program. Mineralization in this target area occurs in the form of native gold in quartz veins primarily within the stockwork zone around the main Josh Vein. Â This new high-grade zone, originally hit in hole NB-14-399, is expanding at depth with grades that are 5 to 15 times the average of the system overall and higher than the main Josh Vein. Â These results indicate that the most productive part of the system is not exclusively the main Josh Vein and opens up the possibility of further broad above Josh Vein grade zones within Yellowjacket’s stockwork. *The vein intervals are defined as having >50% quartz infill and stockwork is defined as the interval in the immediate hangingwall and footwall of the vein where overall vein density exceeds 5%. Within the stockwork zones, a cutoff of 0.3g/t gold equivalent has been used assuming a 59:1 price ratio of gold to silver. Figure 1: Location of Phase II drill holes at Yellowjacket. Â Assays from the holes indicated in fuchsia are reported in Table 1. Â Black traces are from holes with pending assays. Holes are labeled with last 3 digits of name. 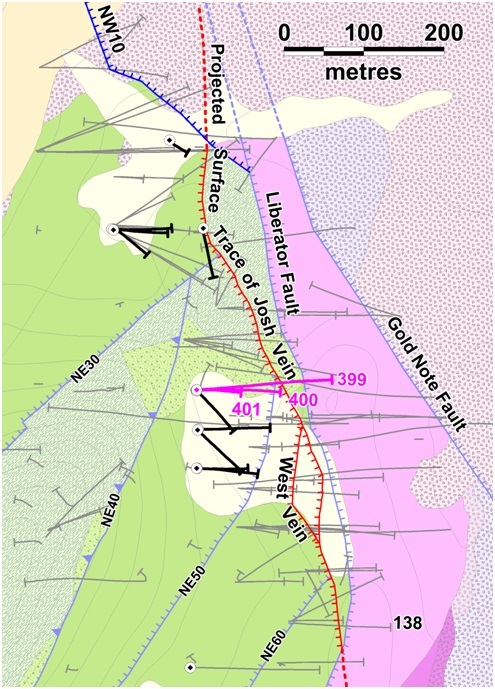 Holes NB-14-400 and NB-14-401 confirm the down dip continuity of the Josh vein system and suggest that the interaction of two faults may be responsible for the broad zones of stockwork and bonanza grades found in these holes (Figure 2). 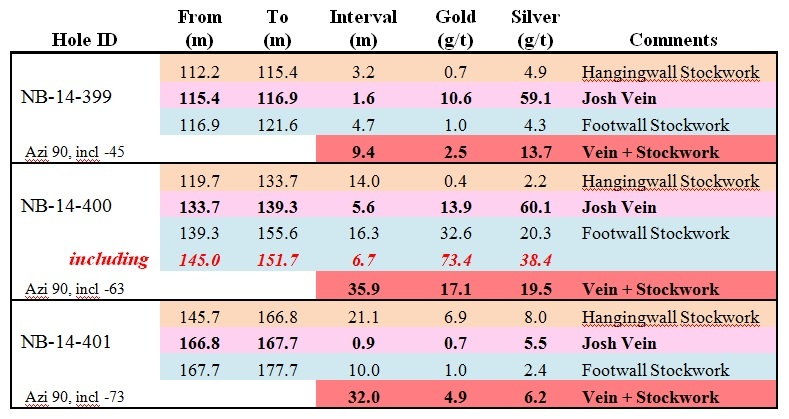 Â The consistency of the mineralization in NB-14-400 is remarkable, with 40% of the samples having more than 10 g/t gold (Table 2). Â Within the stockwork, native gold occurs in millimeter wide veinlets where they interact with pre-existing veins forming spectacular dendritic textures (Figure 3). Â The style of mineralization is similar to that observed in hole NB-13-347 (14m @ 7 g/t gold and 21 g/t silver, NR13-20, September 5, 2013) and NB-14-399 (9.4 m @ 2.5g/t gold and 14g/t silver; NR14-18, October 1, 2014) which are approximately 50 metres up plunge from NB-14-400. Â Work is currently underway to determine the specific controls on this bonanza grade mineralization.Â The gap target zone is currently about 200 metres long and has been tested to a depth of about 175 metres down dip. Corvus is currently utilizing two core drills focusing on expanding the Yellowjacket resource along strike, internally and at depth. Â Phase II drilling will include approximately 30 core holes designed to expand the Yellowjacket deposit, define bonanza grade shoots within the deposit and provide material for continuing advanced metallurgical testing.Â The Phase II program will continue through November and, following the return of all results, the Company plans on calculating a new estimated resource in the first quarter of 2015.Â This resource will form the basis of an initial Preliminary Economic Assessment (PEA) that will incorporate the Yellowjacket discovery.Â The PEA is scheduled to be completed in Q2 of 2015.Â In addition, Corvus is engaged in detailed metallurgical studies of the new high-grade mineralization which have provided very encouraging initial results.Â The North Bullfrog Project is also being advanced on a number of development fronts as well as project characterization work ahead of permitting. Figure 2: Geological cross section through NB-14-400 and 401 illustrating the faulting that appears to control the mineralization. Â Traces are coloured by gold grade with red meaning 1-4g/t gold and fuchsia indicating greater than 4g/t gold. Â This is the first time the Josh Footwall Fault has been identified but it appears to be an important control on mineralization. 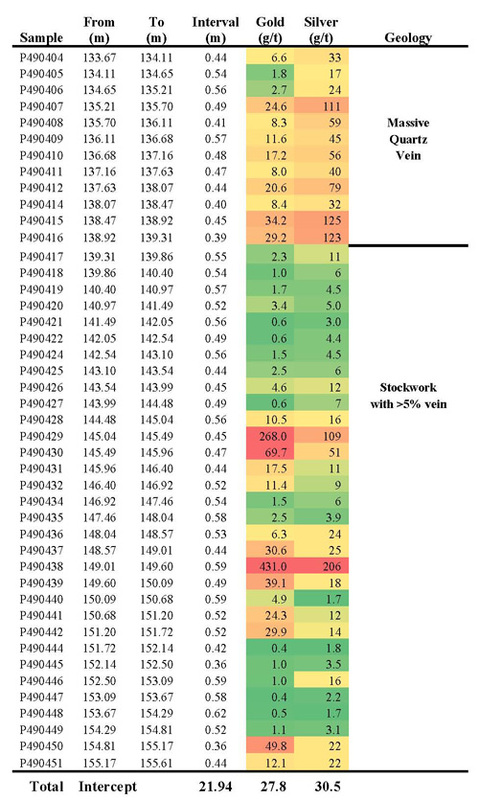 Table 2: Individual assays from vein and footwall stockwork in NB-14-400 illustrating the grade distribution. 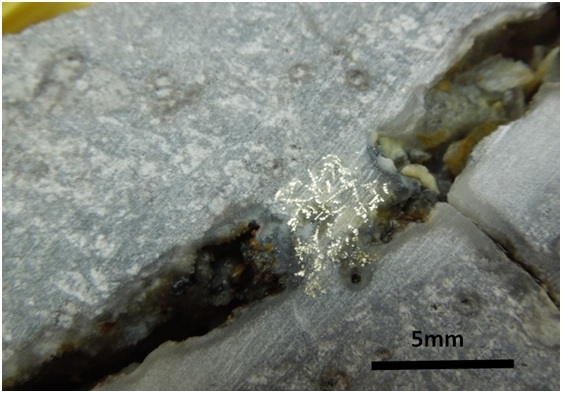 Figure 3: Dendritic gold mineralization in bonanza grade zone, 6.7 m @ 73.4 g/t gold (NB-14-400). Carl E. Brechtel, (Nevada PE 008744 and Registered Member 353000 of SME), a qualified person as defined by National Instrument 43-101, has supervised execution of the work outlined in this news release and has approved the disclosure herein. Â Mr. Brechtel is not independent of Corvus, as he is the COO and holds common shares and incentive stock options. Corvus Gold Inc. is a North American gold exploration company which is focused on advancing its 100% controlled Nevada, North Bullfrog project towards a potential development decision.Â In addition, the Company controls a number of other North American exploration properties representing a spectrum of gold, silver and copper projects. This press release contains forward-looking statements and forward-looking information (collectively, “forward-looking statements”) within the meaning of applicable Canadian and US securities legislation.Â All statements, other than statements of historical fact, included herein including, without limitation, statements regarding the anticipated content, commencement and cost of exploration programs, anticipated exploration program results, the discovery and delineation of mineral deposits/resources/reserves, the potential to develop multiple Yellowjacket style high-grade zones, the possibility of further broad above Josh Vein grade zones to be found within the Yellowjacket stockwork zone, the potential for there to be additional high grade shoots of mineralization at Yellowjacket, the potential for the North Bullfrog project to enter the permitting process towards a potential development decision; Â the potential to discover additional high grade veins or additional deposits, the potential to expand the existing estimated resource at the North Bullfrog project, the timing and completion of the Phase II drill program, the timing and completion of the planned updated resource estimate and PEA for the North Bullfrog project, the potential for any mining or production at North Bullfrog, the potential for the Company to secure or receive any royalties in the future, business and financing plans and business trends, are forward-looking statements.Â Information concerning mineral resource estimates may be deemed to be forward-looking statements in that it reflects a prediction of the mineralization that would be encountered if a mineral deposit were developed and mined.Â Although the Company believes that such statements are reasonable, it can give no assurance that such expectations will prove to be correct.Â Forward-looking statements are typically identified by words such as: believe, expect, anticipate, intend, estimate, postulate and similar expressions, or are those, which, by their nature, refer to future events.Â The Company cautions investors that any forward-looking statements by the Company are not guarantees of future results or performance, and that actual results may differ materially from those in forward looking statements as a result of various factors, including, but not limited to, variations in the nature, quality and quantity of any mineral deposits that may be located, variations in the market price of any mineral products the Company may produce or plan to produce, the Company's inability to obtain any necessary permits, consents or authorizations required for its activities, the Company's inability to produce minerals from its properties successfully or profitably, to continue its projected growth, to raise the necessary capital or to be fully able to implement its business strategies, and other risks and uncertainties disclosed in the Company’s 2014 Annual Information Form and latest interim Management Discussion and Analysis filed with certain securities commissions in Canada and the Company’s most recent filings with the United States Securities and Exchange Commission (the “SEC”).Â All of the Company’s Canadian public disclosure filings in Canada may be accessed via www.sedar.com and filings with the SEC may be accessed via www.sec.gov and readers are urged to review these materials, including the technical reports filed with respect to the Company’s mineral properties.